Restoration counts for more than half of all building work these days. Since the 1970s the renovation of old buildings has become increasingly important. Both buildings from the postwar era and historic buildings must be adapted to conform to current standards. This conformity is not only important for thermal insulation and energy consumption but also all household technical and electrical systems. For example almost no old buildings have sufficient electric wiring, plugs and switches and they do not correspond with modern standards especially safety standards. If renovations are being carried out in an occupied house then the resulting disturbance from noise and dirt must be kept to a minimum. A 1920s house can be updated to our multimedia era without cutting new channels in the walls. 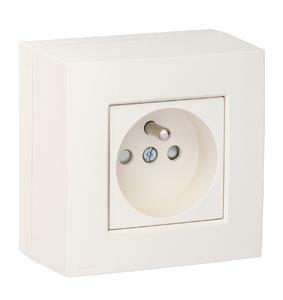 New plugs and light switches are increasingly attached onto the outside of plaster walls and the necessary wiring is carried in the skirting board along the surface of the wall. All electrical systems such as plugs, switches, sockets for telephones and internet, alarm systems, automatic shutters and blinds require leads and controls and these can be attached to the surface of the wall. The Belgian company NIKO (in business since 1919) is a specialist in lighting and electrical installations who offer a range of over 5000 different products and produce top quality light switches, power outlets and telephone and internet sockets. NIKO's product spectrum also includes modern alarm systems, hightech smoke detectors, multimedia technology and intelligent household systems such as lighting and blind controls or heating and air conditioner regulators. With innovations such as the invisible wall module "Mysterious" the Belgian company are at the top of their game. 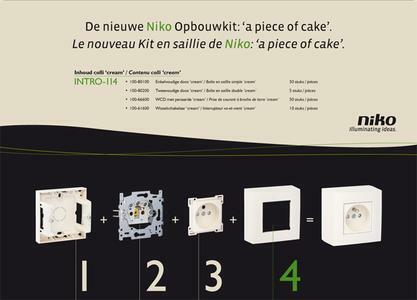 NIKO is based in Sint-Niklaas (Belgium) and has 550 employees. NIKO products have a turnover of 90 million Euros and are marketed worldwide, though predominantly in Belgium, France, the Netherlands, Slovakia and Spain. NIKO has responded to the increasing demand for overplaster solutions in modern building work by creating a brand new surface mounted product. The company offers an aesthetic new solution: A single enclosure for attachment to the wall surface. NIKO products such as standard plugs, telephone and datacommunication sockets, and control boxes for intelligent household technology, light switches and dimmers can then be screwed onto this base, just like their "underplaster solutions". All in all 16 different versions of the surface mounted enclosure are manufactured by NIKO in their fully automated facility in three operational shifts. The great advantage: All these underplaster solutions can now be attached on this one surface mounted enclosure. 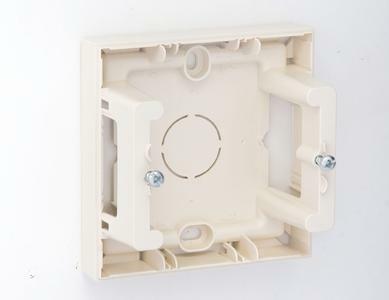 The socket components are attached to this enclosure using either two or four selftapping screws, the screws being assembled manually by a handheld screwdriver, a laborious, timeconsuming task which produced inconsistent results. Due to the rise in demand for this product the need arose for a reliable solution tailormade to NIKO's specific requirements. "An individual team of engineers is responsible for automated production at NIKO" explains Head Engineer Pierre Rottiers. 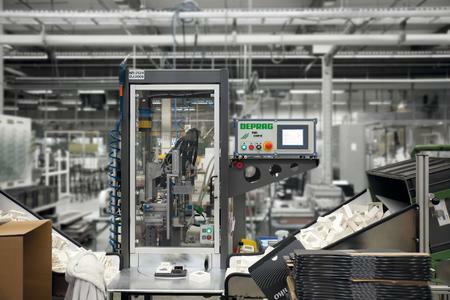 "In our selfdeveloped machine system DEPRAG pneumatic screwdrivers are already in use performing 60 assemblies per minute over three production shifts. We have had good experience with their reliable high precision screwdriving technology. Therefore we got in touch with Assembly Welding Plasma (AWP), which represent the German manufacturers DEPRAG SCHULZ GMBH & CO. in Belgium and gave them the contract to design the assembly of our new surface mounted enclosure based on our specifications for the assembly cells." DEPRAG SCHULZ GMBH & CO. based in Bavaria, Germany is an international specialist for automation and screwdriving technology. Sales Manager Jürgen Hierold: "One of the great advantages for our customers is our versatility. Our assembly experts adapt standard system components from our extensive product range to fit customers' specific needs. We are therefore able to provide lowcost solutions in a short time frame. Our wellknown screwdriving and assembly systems are valued in particular for their flexibility and efficiency". Pierre Rottiers recalls the cooperation and consultation with DEPRAG and the professional handling of the project: "In November 2008 the first studies were carried out. A couple of months later came the final contract for the machine. During the design phase, a 3Danimation of the proposed system enabled us to make suggestions for further refinements. After final inspection at DEPRAG, where the technical parameters were checked in detail, the machine was delivered on time and has now been 100 % operational since August 2009". NIKO's specifications for the assembly cell were set out over 26 pages for DEPRAG to work from. The 2000 mm high, 1150 mm wide and 1150 mm deep complete system processes both NIKO's surface mounted enclosures - single and double. They receive either two or four selftapping screws. Both versions of the product can be processed by the same part nest tooling eliminating the need for mechanical changeover. Using the operator interface panel (HMI) the operator can simply choose whether a single or double component should be processed. The type of screw assembly can also be selected, since, screw assembly to depth, torque or both are possible using DEPRAG screw assembly technology. The assembly cells are equipped with a manually operated two position rotary table: enabling the operator to load and unload one part nest while the second part nest is in the assembly process. This helps to reduce the overall machine cycle time. Inside the assembly cell there is a twospindle screwdriving system, where two screws can be assembled simultaneously. 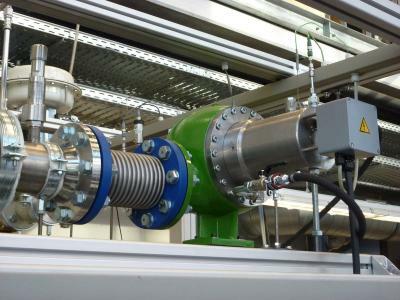 When processing NIKO "double" components, which require 4 screws, the screwdriving function module rotates on a pneumatic actuator to process the third and fourth screws. DEPRAG pneumatic screwdrivers from the MINIMAT® series, wellknown worldwide, are used in this application. Some NIKO products require the screws assembled to depth and others to torque. When the selftapping screws are to be assembled to a specific depth (in this case 3.5 mm+0.8/-0.4 mm) using a pneumatic screwdriver spindle, then a specific method is employed in order to attain the highest precision: Upon reaching the selected screw depth the supply air for right rotation is disabled and at the same time a short impulse for left rotation is engaged so that the screwdriver stops immediately. Kurt Willems, Sales Manager of AWP, explains: "This is how we ensure that the screws reach the exact depth required which is an important precondition for the remaining assembly steps". If torque (in this case 60Ncm+/-10Ncm) is required then the highly precise DEPRAG MINIMAT® shutoff clutch - immediately disengages when the preset torque has been achieved. The selftapping screws used in the NIKO Product are processed by a DEPRAG screw feed system. Using a vibratory bowl the screws are sorted, separated and then blown through a feed hose to the jaws of a screwdriving function module. For each and every screw assembly sequence the quality parameters such as, screw presence, screw depth and torque (mechanical clutch disengagement) are monitored and evaluated. The assembly cell is equipped with a simple Touch Screen for the operator. There are clear symbols and text in the operator's native language enabling present and future users a seamless interface with the machine. If a product is assembled correctly then a green lamp indicates an OK signal for removal of the finished component. If a red light is shown then the screw assembly process was not successful and must be reworked or inspected. The assembly cell indicates the exact screw positions which are out of tolerance. The system is also prepared with the flexibility to allow the operator a reassemble/retry sequence for any of the four screw positions on the product so that components can be reworked in process if desired. The choice of screw position and the screwdriving procedure (depth, torque or both) can be selected on the operator interface panel. 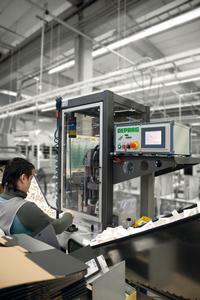 DEPRAG's "stand alone assembly cells" combine high efficiency with the utmost process and quality control. Many of DEPRAG's clients who assemble electronic components particularly value their flexibility. For NIKO too, it was the universal application capability of the assembly cells combined with the company's efficiency which was decisive in their choice to award DEPRAG this contract. Using the new assembly platforms NIKO can assemble 12 components per minute which not only increases efficiency in their production but also means a saving of 40 % in costs. "After two and a half years the machine will have paid for its initial purchase costs working just in a single shift cycle", Pierre Rottiers praises the acquisitions as an extremely successful investment. Assembly Welding Plasma (AWP) has over 10 years of experience in screwdriving technology and has represented the German company DEPRAG SCHULZ GMBH & CO. for over three years in Belgium and Luxemburg. Sales Manager Kurt Willems is committed to the DEPRAG solutions. DEPRAG offers full service solutions for almost every sector of industry and the company is wellknown for their expertise and decades of experience. 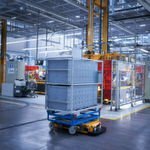 The specialists for screwdriving, automation, air motors and air tools have over 600 employees and are represented worldwide in over 50 countries. DEPRAG not only equips system integrators with innovative screwdriving and feeding technology but also offers comprehensive automated solutions. 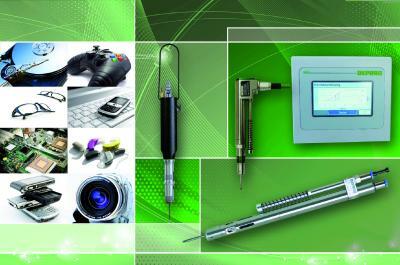 They are a "one stop shop" company which pays off for customers particularly when it comes to service and maintenance.